Shop with us for Nashville gifts and souvenirs at Nashville’s largest gift shop located here at the Willie Nelson and Friends Museum. Not sure what to get that special person? Stop in and see us because we have thousands of great Nashville, country music and Jack Daniel’s gifts and souvenirs. As you would expect, we have lots Willie Nelson t-shirts, hoodies, mugs, bandannas and braids, BBQ sauces, DVD movies, music CD’s and other Willie merchandise. 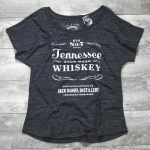 But we also carry a huge assortment of unique Nashville souvenirs, Johnny Cash T-shirts, Waylon Jennings T-Shirts, Jack Daniels Gifts and country music merchandise and related souvenirs.We’re also your “go to” source for Tennessee Souvenirs along with Nashville local foods. We have a great selection of foods that are made especially for us and will give you a good sampling of various tastes of the South. 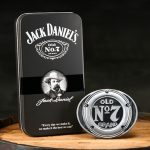 And since we’re only 45 minutes down the road from the world famous Jack Daniel’s distillery you can bet we’re going to carry a lot of Old No.7 Brand merchandise. And we do! 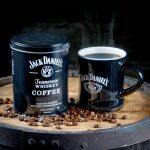 We carry the largest assortment of licensed Jack Daniel’s merchandise that you’ll find anywhere in town or online. Stop in and see our collection of men’s and ladies Jack Daniel’s clothing including t-shirts, hoodies, tank tops, rodeo shirts and jackets. 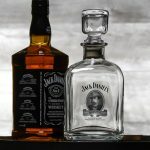 Looking for Jack Daniel’s barware? Great, because we stock it all including decanters, shot glasses, mixing glasses, double old fashions and rocks glasses all proudly sporting the Jack Daniel’s logo. Many people say you just can’t have enough Jack Daniel’s barware. So if that’s true you’re sure to be able to find your next “must have” shot glass or tumbler somewhere in our big selection of barware. Or, if you’re looking for barware gifts Jack Daniel’s lovers check out this travel flask for the bar on the go! Looking to kick your wardrobe up a notch? And who isn’t? Then you’ll definitely want to check out our line of Jack Daniel’s belts and buckles because we have lots of them. Not to mention the full offering of Jack Daniel’s wallets in many shapes, colors and styles. We carry so many Jack Daniel’s belts, wallets and buckles you might just have a tough time picking the perfect combination. But, at least you’ll have fun trying. Oh, I almost forgot to mention the edible goodies we carry like Jack Daniel’s coffee, Jack Daniel’s Fudge Caramels, Pecan Pralines and of course, Jack Daniel’s Whiskey cakes! 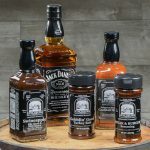 You’ll be amazed at the number and varieties of food products we carry that contain some of that great locally made Jack Daniel’s Tennessee Whiskey. Our customers also love the Historic Lynchburg Tennessee Whiskey Brand products made near here and simmered in small batches in the hills of Tennessee. They’re made that way to insure consistency so as not to screw up the old family recipes, so you can enjoy them they way they were mean’t to be. Looking for a great seasoning for your hamburgers, then try the historic Lynchburg “Steak & Burger” seasoning or the ever popular historic Lynchburg “Swineapple” BBQ sauce. These products are some of the best you’ll find anywhere. Don’t take my word for it, products from this line have won more than 200 National and International Awards. In fact, the Master Que BBQ Sauce was voted the best BBQ sauce on the planet after winning 1st Place at the American Royal – the world’s largest BBQ sauce event! I’m getting hungry just thinking about it. if you can’t make it to Nashville, visit us at our Nashville souvenirs online location on the internet – NashvilleSouvenirs.com! Don’t like messing with computers? No problem, just give us a call and we’ll help you order by phone. You can also keep up with happenings at the Willie Nelson Museum on Facebook, Twitter and Pinterest pages. And if you’re a history buff read how the General store began over 40 years ago. You can also follow Nashville Souvenirs on Facebook, Pinterest and Instagram. Check them out for current and new offerings of Nashville, Willie Nelson, Jack Daniel’s and Country Music gifts. Thanks and we look forward to hearing from you real soon.